Being away, but not from away, discovering the Maine Exiles page was a treat. I ordered 2 mugs as shown in the photo and kudos to the team for quality and service beyond my expectations. Their banner reads “Loving Maine… Living Away”. The package arrived last week, and it took this long to finally take photos and crop the background to create the graphic shown. Besides a confirmation email on the day they were mailed, the box arrived well protected with extra packing material and contained the 2 mugs, the invoice, and a Maine post card with a handwritten personal note. 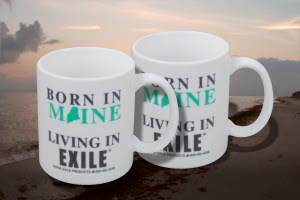 Visit the Maine Exile Products website to see the selection of exile gifts to send to all the Mainers you know who are away. My site stats show many of my blog readers are away and visiting this site anywhere from New Hampshire to California, and places in between. Quality and service with a personal touch reminds me of the way life should be. I sense a great state slogan somewhere in there.